Following four consecutive playoff seasons, including a 14-2 record in 1999, the Jacksonville Jaguars were struggling at 3-7 as they faced the Steelers in Pittsburgh on November 19, 2000. Head Coach Tom Coughlin’s team had run into injury problems, particularly along the offensive line. Third-year RB Fred Taylor (pictured at right) missed the first three games with a torn ligament in his knee, but was coming off of four straight 100-yard rushing performances and the offense also still contained strong performers in QB Mark Brunell and wide receivers Jimmy Smith and Keenan McCardell. The Steelers were a streaky 5-5, having lost their first three games, won five straight, and then been beaten in their last two contests. QB Kordell Stewart regained the starting job after starting out behind journeyman QB Kent Graham. RB Jerome Bettis was a potent power runner and overachieving WR Hines Ward the most reliable receiver. As was typically the case under Head Coach Bill Cowher, the defense was stingy. Pittsburgh had already beaten Jacksonville on the road. There were 50,925 fans in attendance for the Sunday night contest at Three Rivers Stadium. The teams traded punts for most of the opening period until the Jaguars turned the ball over when Mark Brunell fumbled while being sacked by SS Lee Flowers. LB Jason Gildon recovered at the Jacksonville 37. Two plays later, Kordell Stewart threw to Hines Ward for a 32-yard touchdown. Kris Brown added the extra point and the Steelers took a 7-0 lead into the second quarter. The Jaguars, who had been losing the battle for field position as the teams continued to exchange punts, finally got a break when LB Kevin Hardy intercepted a Stewart pass at his own 44. Facing second-and-19 after a penalty backed the visitors up, Brunell completed a pass to Jimmy Smith for 20 yards and, two plays later, he connected with Keenan McCardell for 17 yards to the Pittsburgh 28. 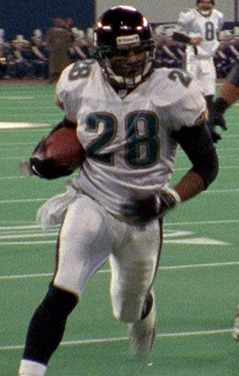 Fred Taylor finished the six-play possession off with a 25-yard run for a TD. Mike Hollis converted to tie the score. The Steelers moved well on their next series. Stewart passed to Ward for 22 yards and Jerome Bettis had runs of 16 and 17 yards. The drive stalled at the Jacksonville 22 and Brown kicked a 40-yard field goal to move Pittsburgh back in front by 10-7. Jacksonville responded with an eight-play, 65-yard series. Taylor had a 31-yard carry along the way and, in a third-and-12 situation, caught a pass from Brunell for a 16-yard touchdown. Hollis added the point after and the visitors were in the lead by 14-10. Pittsburgh appeared to be on the move when a Stewart pass to RB Richard Huntley gained 18 yards to the Jacksonville 42, but on the next play the quarterback was sacked by DT Gary Walker and fumbled, giving the ball to the Jaguars at the Pittsburgh 39 with 39 seconds remaining in the first half. Jacksonville extended its lead to 17-10 on a 36-yard Hollis field goal. The Steelers had the first possession of the third quarter and punted. Brunell completed four passes, three of them to Smith, with the longest covering 21 yards to the Pittsburgh 15. However, another pass to Smith for an apparent touchdown was overturned upon replay review and the Jaguars had to settle for a 33-yard Hollis field goal that put them 10 points ahead. Jacksonville got another opportunity in short order when WR Troy Edwards fumbled while returning the ensuing kickoff and FB Daimon Shelton recovered for the Jaguars at the Pittsburgh 36. Taylor immediately took off for a gain of 34 yards and, on the next play, carried again for a two-yard touchdown. Hollis kicked the extra point to give the visitors a commanding 27-10 lead. The Steelers were on the move on the next series before WR Bobby Shaw fumbled after gaining 15 yards on a pass from Stewart. FS Rayna Stewart recovered at the Jacksonville 42. It took just four plays for the Jaguars to advance 58 yards as Brunell converted a third-and-eight situation with a completion to TE Kyle Brady for 30 yards and Taylor ran 26 yards up the middle for another TD. Hollis again converted and the Jaguars, taking good advantage of opportunities presented by turnovers, were ahead by 34-10. Pittsburgh drove to a score on the next series, with Stewart running for a two-yard touchdown on the first play of the fourth quarter. The try for a two-point conversion failed. The Jaguars came back with a solid drive into Pittsburgh territory that included a 19-yard run by Taylor, but CB Chad Scott picked off a Brunell pass and the Steelers drove 56 yards in seven plays. The biggest was a 45-yard touchdown run by Stewart and this time the try for two points succeeded. Pittsburgh had narrowed the margin to ten points with 7:56 remaining in regulation. The Jaguars were forced to punt following a short possession and the Steelers, helped by a 15-yard penalty tacked on to the punt return, started from the Jacksonville 49. Stewart completed a pass to Shaw for 18 yards, but the drive stalled at the 24 as Ward, wide open at the goal line, dropped a pass after slipping and Brown’s 42-yard field goal attempt was unsuccessful. With 4:39 left to play, the Jaguars kept the ball on the ground and Taylor had runs of 15 and 25 yards to advance into Pittsburgh territory and run the clock down. They finally turned the ball over on downs at the 24 with the time remaining now down to 1:02. SS Donovin Darius intercepted a Stewart pass to clinch the 34-24 win for Jacksonville. The Jaguars had the edge in total yards (417 to 302), first downs (20 to 15), and time of possession (34:20 to 25:40). They also recorded five sacks, to three for the Steelers, and Pittsburgh turned the ball over five times, four of which led to Jacksonville scores, against two suffered by the visitors. The Jaguars were penalized eight times, at a cost of 55 yards, to four flags thrown on the Steelers. The 34 points surrendered marked the highest point total that Pittsburgh gave up during the season, by far (and it would not be exceeded in the remaining contests). Fred Taylor had a huge performance as he rushed for 234 yards on 30 carries that included three touchdowns, and he added a fourth TD on one of his three pass receptions for 14 yards. Mark Brunell completed 17 of 31 passes for 190 yards and a touchdown while giving up one interception. Jimmy Smith had 6 catches for 85 yards and Kyle Brady contributed 62 yards on his five receptions. 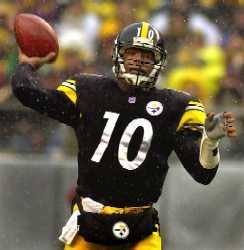 For the Steelers, Kordell Stewart (pictured above) was successful on 13 of 27 throws for 188 yards and a TD while being intercepted twice. He also rushed for a team-leading 59 yards on 6 attempts that included two scores. Jerome Bettis was right behind with 57 yards on 12 carries. Bobby Shaw topped the receivers with 5 catches for 81 yards, although he also had a costly fumble. The big win over Pittsburgh was the first of four straight for the rejuvenated Jaguars, but they finished the season with two narrow losses to end up at 7-9 and fourth in the AFC Central. It was their first losing record since their inaugural season in 1995. The Steelers won four of their last five games for a 9-7 tally that put them in third place in the division. Fred Taylor’s yardage total set a still-standing franchise record (to date) and also was a new high for an individual performer against the Steelers. He went on to rush for 1399 yards in 13 games, averaging 4.8 yards-per-carry and scoring 12 touchdowns.